Video isn’t about facts and figures. Video is about emotion. That’s one of the reasons I actively encourage our clients to feature their employees because real people tap emotion better than products or services. One of the organizations doing the best job of this lately is the University of Southern California’s athletic department… in particular the football team. Yes… the USC Trojans… 6 Heisman Trophies, 11 National Championships, 24 Rose Bowl victories… those USC Trojans. Watching the school’s videos, it’s clear the university’s leaders are making an effort to promote USC using their star athletes. Sure, they highlight their talents on the field, but more and more they’re figuring out ways to feature them off the field as well. The theme to those videos… fun… and USC’s most recent video serves as a great example to businesses. It features Heisman Trophy candidate Matt Barkley and some of the team’s other stars walking around campus in their full uniforms… pads and all. It’s goofy, but it’s goofy that serves a purpose. College and college football are fun. Now, watch the video again with your business goggles on. If USC football is a company, the athletic director and coaches are senior management, and these players represent their top employees. The company’s leadership is shinning a spotlight on their top people. They’re highlighting their personalities in an effort to promote the brand. They’re using “fun” to tap emotion. Heck, they even provide the employees’ Twitter handles to encourage viewers to follow them on the social web. I’m not suggesting that every business should go out and manufacture “fun” videos. What I’m saying is that they should look at the company and highlight the aspects important to the company culture. 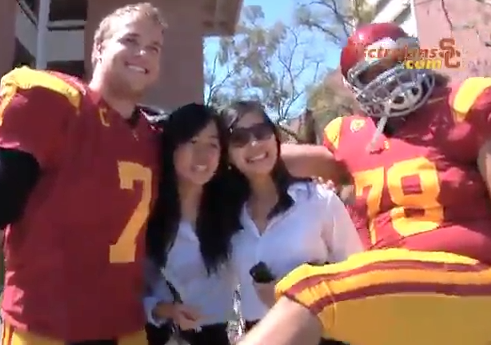 At USC, they’re all about winning football games and having fun, so that’s what their videos are about. At your company, you might be all about excellence and ingenuity. Produce videos that highlight employees who embody those characteristics.